Honourable Folks, we may not tell who’ll be in the State House next year but it’s more likely to be one of the four—Joyce Banda (PP), Lazarus Chakwera (MCP), Peter Mutharika (DPP) and Atupele Muluzi (UDF). Of the four, the new kid on the block is Chakwera and understandably, it didn’t go down well in certain quarters when we, in the media, described him as a “game changer.” Some charged that was tantamount to endorsing the man of collar. Such is the tension characterising relations in the run-up to the elections that the media is disrobed of its claim to being non-partisan. But keys to the State House are always with the electorate, not the media. By ditching old man John Tembo for Chakwera, MCP now has the “equal chance” ace in its hands. By this I mean, the oldest party on the land is as good as PP, DPP or UDF unlike when Tembo was at the helm where he personified the MCP people rejected in 1993 and 1994. But that’s as far as it goes. 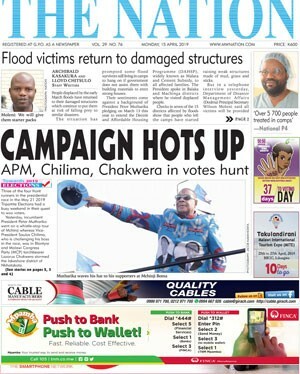 Chakwera’s disadvantage is that he’s the least known to the voters, particularly in rural South and rural North. To become a good enough household name within the remaining eight months is an uphill battle that he alone will have to fight. But all the contenders have another major challenge to surmount—putting up a convincing case why people should vote for them. There’s no denying that there are still people out there who are happy to sell their vote for a packet of sugar, a brown envelope or a calabash of masese (local beer). But I believe generally Malawian voters have become smarter in the 19 years that have elapsed since we first voted under the multiparty dispensation in 1994. My generation is crying loud for transformational leadership. Any presidential candidate who responds to that call with empty and boring promises of “creating a river where there’s no river,” or banks 100 percent on the numerical supremacy of their regions of origin or ethnic groupings, has the outcome of the 2009 polls to learn from. Mutharika swept the votes across regional and tribal lines for the simple reason that he was perceived to be visionary. Political contenders in the presidential race should also bear in mind that demographic changes have pushed the youth centre stage. Look at it this way; babies born on 14th June 1993—the day Malawians ditched one party dictatorship for a multiparty system of government through a national referendum—will be almost 21 years old by the time of tripartite polls in May 2014. First time voters in the forthcoming polls are the ones born in 1996, two years into the multiparty dispensation. Add those who were toddlers at the dawn of the ‘90s and the picture is clear that a significant group of voters in 2014 is made of young adults. Global trends show that the youth get bored more easily with empty campaign rhetoric. They may register alright but if unimpressed by the campaign messages they simply go out and play ball on elections day, instead of heading to the polling centre. If I were a contender in the 2014 presidential race, I would harness the ‘aha’ factor to my campaign message to get the youth’s swing vote. I’d try hard to polish my message “to a gem-like point” and sell it Obama-style to bring excitement to the boring campaign and give the youth a reason to share my message among themselves through social media—Twitter, Facebook, Linkedin, Flicker, Instargram, etc. My message would be twofold. First, I’ll sell myself not as an opportunist bent on robbing the country of its billions but as a person of integrity, ready to serve (not to be served). I’ll have a clear message on fighting corruption and giving all Malawians an equal opportunity to use their creative geniuses for their own good and the good of their country. Secondly, I will have to share my vision on how to create wealth so as to reduce poverty, improve living standards of the people and develop the country. I’ll wrap it all with a message on how to ensure that democracy leads to a happy and fulfilling life for Malawians. Again, let me remind the contenders that in 2004, Mutharika won the support of the majority who had denied him the vote simply by articulating good policies in his inaugural speech. The challenge then, as is the case now, is that many people surrounding the contenders are thugs bent on reaping where they did not sow. They like it when the country is bleeding while they are stashing public money into their dirty pockets.